How hard is it to follow a simple set of instructions? I found a picture of the most confusing set of instructions for a light switch you could ever imagine via Boing Boing today. 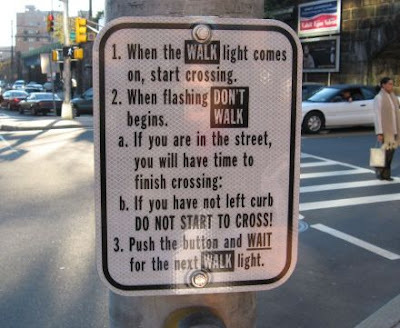 And it reminded me of a sign I ran across when doing a story on pedestrian safety. This sign rests under a crosswalk in New Brunswick, New Jersey. And to be honest, I can’t understand why more people haven’t been found dead in the middle of this intersection. The photo comes courtesy of the New Jersey Bicycle and Pedestrian Resource Center at Rutgers University. I think my issue is that it shouldn’t take nearly so many words to explain a traffic signal with two words on it: Walk, and Don’t. It takes about as long to read this sign as it does to cross the street. Incidentally, if this is the street I think it is, the pedestrian almost never gets the signal anyway. We stood on that corner for about 10 minutes before giving up and jaywalking. It will take a tragedy for people to wake up and start following instruction. agreed. If you don't understand it you have more problems than the sign does.